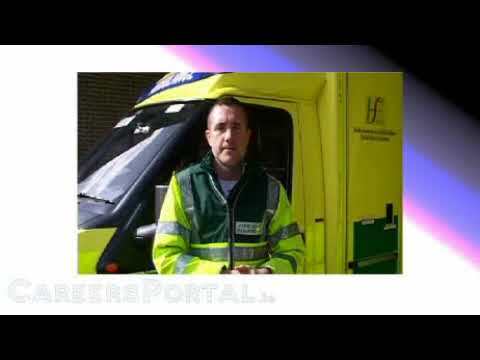 Keith works as an Advanced Paramedic with the National Ambulance Service and is based in Dublin. He pursued this career directly from leaving school and has gone on to complete a Higher Diploma in Emergency Medicine. Despite the sometimes horrific incidents he is called to attend he remains upbeat and rewarded by the unique and influential role he plays in life and death situations. Early in my teens I had a fair idea what career path I intended to follow and that was to work in the Emergency Services, preferably with the Ambulance Services. So it would be fair to say I focused all my attention and efforts in everything I did to achieve this. Luckily ‘for me’ it paid off. Having this to focus on, I suppose kept me occupied took away some of the peer pressures, kept me out of trouble. I’d join voluntary organisations, spent time visiting Ambulance stations and Fire stations taking the appropriate options/ subjects in school such as biology, chemistry. Choosing a career in the Emergency Services and namely as a Paramedic was influenced through TV not so much soaps but the documentary programmes were film crews would follow Paramedics throughout their day. Once you join and become a Paramedic there are many influences on your career and development. Friends and colleagues that you make in the job will influence you for the most part, as will other professionals such as doctors, nurses and other emergency workers. However, it would be very difficult to achieve your goals without the influence and above all the support of your family and friends. When I was looking to become a Paramedic I had to check the appointment section of the national news papers for the position to be advertised. Now the positions are advertised through different methods such as national papers and websites. When you apply for the position you go through various selection procedures, beginning with responding to the advertisement and completing the application form. After this you have to pass an aptitude test which is followed by a panel interview and medical. On successful completion of these stages in which you would be awarded scores/ points based on your performance, you would be placed on a panel reflecting the amount of points you’ve obtained. This means the better your performance and competencies the more points you gain, and the more points you gain the higher on the panel you get. Once selected from the panel you may be offered a place as a student Paramedic and sent to college for training. From there you must demonstrate that you have the ability and competency to become an operational Paramedic by passing the college exams and assignments as well as the State exams to secure a place on the State register*. *State register; to practice as a Paramedic or Advanced Paramedic in the Republic of Ireland you must successfully complete the exams and secure a place on the statuary register outlined by the Pre-hospital Emergency Care Council (PHECC). A Paramedic for the most part doesn’t have a ‘typical’ day, and this I suppose for me and most Paramedics is the attraction to the job. No two calls are the same while they may be similar they’re never the same so there is great variety in the work through the calls and the people you engage with. Your shift starts with meticulously checking your vehicle and your equipment ensuring everything is in place and in good working order. You can not assume everything works or is there as someone’s life may depend on it. Outside the routine calls, such as bringing patients to different hospitals for various procedures, Paramedics must work in all kinds of environments, weather and emergency situations. We attend incidents such as serious Road Traffic Accidents, medical emergencies and social problems. Some times Paramedics are called when people don’t know who else to turn too. The role of a paramedic is very demanding and it is challenging to ensure the patient receives the best level of care. This may be using specialist medical equipment or through administering any of wide array of medications to keep the patient alive. There are lots of situations or emergency calls when you feel under a lot of pressure, for instance, trying to resuscitate somebody in front of on looking family members or trying to save somebody and free them from a serious car crash - this can be a lot to deal with. There can also be the harsh reality that despite all your efforts and determination the person may die in front of you. On the other end of the scale however, to directly save a persons life is immeasurable. My main tasks and responsibilities are broken into two fields as Leading Paramedic (station supervisor) and Advanced Paramedic and they are broadly as follows. Providing basic life support and defibrillator training to other Emergency Services and members of the public to progress the national cardiac strategy, in response out of hospital cardiac arrest. Shift work! This can be difficult especially when you have a family, the shifts are 12 hours long which is a long time to be away from home, and because of the nature of the work sometimes you get called out just when you’re getting set to go home. Sometimes its difficult and challenging to remain compassionate and courteous when you respond to tragic situations that may overwhelm you, such as a drunk driver who has crashed and killed somebody and is now abusing you while you treat his/her injuries. As the work of a Paramedic and Advanced Paramedic is very dynamic it can be hard to keep up your studies while trying to balance everything else, learning ‘just enough’ is never good enough as the more you learn the more the patient you treat will benefit. Responding to Emergency calls is pretty ‘cool’, all the action and the excitement. This can get your adrenaline going, having to think on your feet and getting to use your skills, medications and equipment. Driving on blue lights and sirens is pretty ‘cool’ too. Although most of the time when you arrive at the scene of an incident, things are bad. However, there are still ‘cool’ times such as delivering a baby in the back of the Ambulance or a car at the side of the road, that can be magic. It’s a great feeling when you learn new skills or administer new drugs and you can see the patient improving immediately. Although you have the excitement and action of responding to calls the reality is when you arrive you have to deal with some horrific things, you will sometimes see people in great distress and suffering. On a positive note though once you get to do your job and use your skills you normally improve things. Generally up for a laugh and craic! Obviously any of the training or education you get through the job is important and beneficial in one form or another, but anything you can bring from your previous studying, roles or job is of great benefit. It’s important to develop an ability to study and apply yourself academically. I suppose it’s great to be able to say that as an Advanced Paramedic or Paramedic I have a career that is very rewarding, it sounds so cliché. But it is, it’s amazing how rewarding and enjoyable it feels when you treat or comfort a patient at a time of crises in their life. When you and your partner work tirelessly to save somebody or minimise the trauma to them and it pays off, because you’ve put the hours study and training in before that call. That the type of reward you get, when that same patient leaves the hospital to resume their life with their family... Magic!! The ability to leave aside your personal problems and stay positive even when you find it difficult, that’s a must. I’ve great motivation and determination if I put my mind to something I do it. I love working with people, so I try to be outgoing, positive and approachable having a laugh a joke when I can. I generally don’t let things get me down I quickly find a way of remaining positive. Hmmmm! That’s answered already… I have it!!! Although I’d love to see Paramedics and Advanced Paramedics evolving into roles on international disaster teams, working along side doctors and nurses because I think there’s a lot we could bring to a team, especially as clinical skills have increased enormously. Working as a Paramedic some sacrifices have to be made and sometimes it’s difficult to keep a regular lifestyle mostly because of working shift work and unsociable hours like weekends, nights and special occasions such as Christmas. However you can still have the lifestyle you desire, there are many Paramedics in the service all from different backgrounds and with different interests keeping the lifestyle they enjoy. Not immediately as I’ve just finished my Higher Diploma within the last year and that was very intense, with a massive commitment needed from me and my family. However there is compulsory refresher training and clinical up skilling on an ongoing basis that I’ll need to do. As you can see from above there is never a shortage of courses or further education open to Paramedics and Advanced Paramedics and no doubt in the near future there will be a course or position that I fancy advertised on the notice board. The HSE National Ambulance Service is currently developing areas where students or people with an interest in the job can apply for work experience in certain sections. There is also the avenue of joining the voluntary ambulance organisations this will allow you access to some equipment and deal with the public and give you a basic idea of the role of a Paramedic or Advanced Paramedic.